If you want to get a lot of cards in your collection fast, Wes from Jaybarkerfan's Junk will be more than happy to make you work overtime in organization. The man is a legend in his generosity. He's not the only Robin Hood out in the blogging world, though. Last year, I received a small priority mailer one day - super heavy. I have packed a few of these (not to bursting) and I can tell you you can stuff about 350-360 cards into one of those boys. All for under six bucks shipped. I was shocked, though, at the return address on the label. This heavy box, loaded with 373 cards by the way, came from the 27th state of the union - Florida. The sender - John from Johnny's Trading Spot. Besides a few PWEs, I have not dropped anything major on John. But he made sure to hit me hard. As I said, it totaled 373 cards. Yes - that is three box bottoms at the bottom of the stacks. We'll talk about them in a bit. John took time to know my binders, and send cards as such. First of were 17 cards that fit either my autograph, bat barrel or outfield catch binder. Except... I don't have any of those. 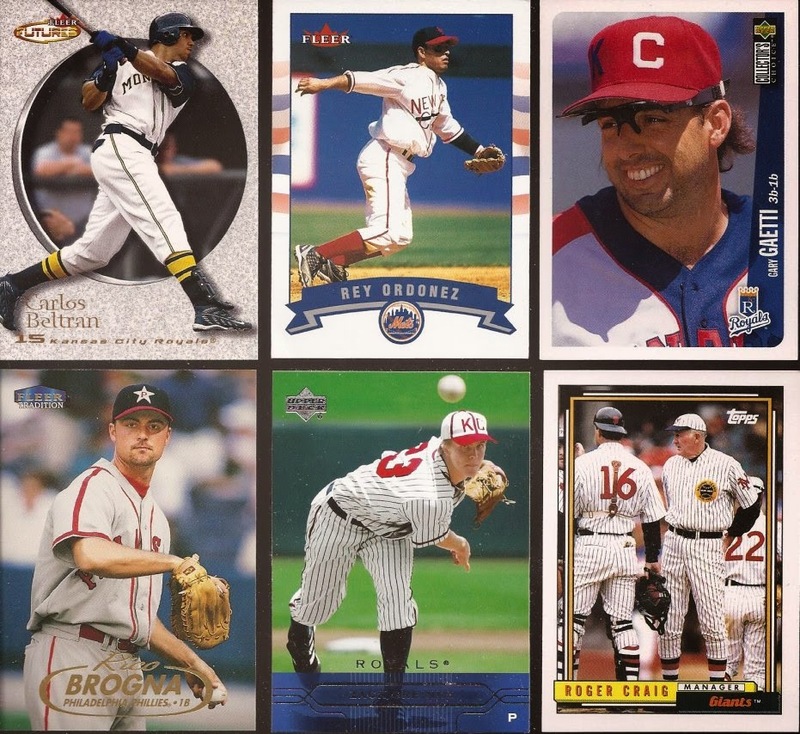 I think a couple of my quirky binders get me confused with Nick at Dime Boxes, who does collect those three subjects. However, Nick and I are hooking up in Orland a week from this Saturday, so I will pass these on to him. 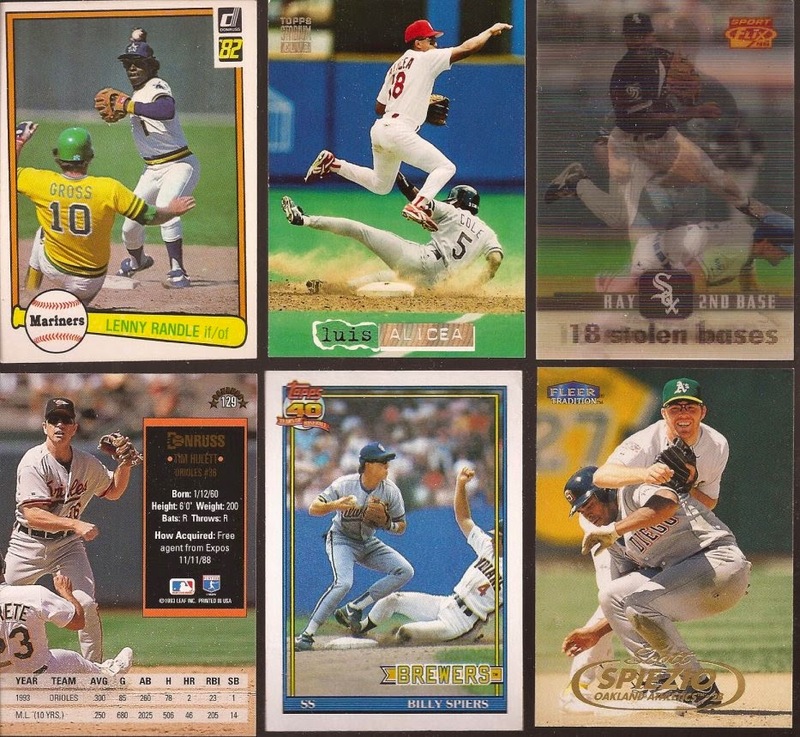 Next largest group were 32 throwbacks, of which 15 were new cards for my collection. Gotta love Craig in a uniform he probably pulled out of his closet. Philly needs to bring back the uniform Brogna is wearing as a Sunday uniform or something. BTW - the other 17 cards are going to Nick. Double plays? There were 56 in the box. 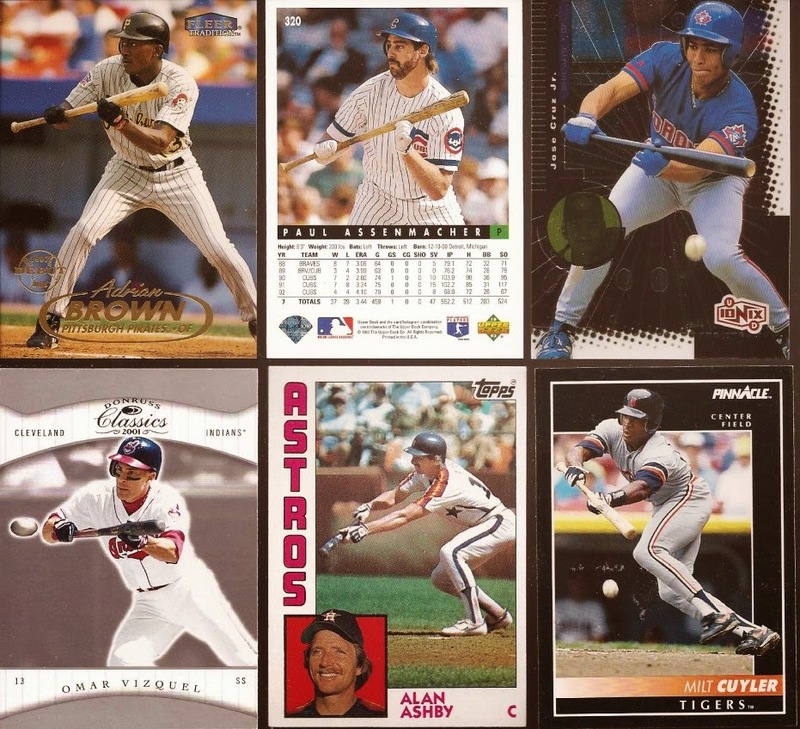 18 Are new additions to my DP binder. That SportFlix scanned really well so you can see Durham turning two. Fun fact - Spiezio is from Morris, IL, about 20 miles west of me. We go to Morris often for a gondola at Corleones. His parent's still own a furniture store that we pass on the way to downtown Morris off I80. 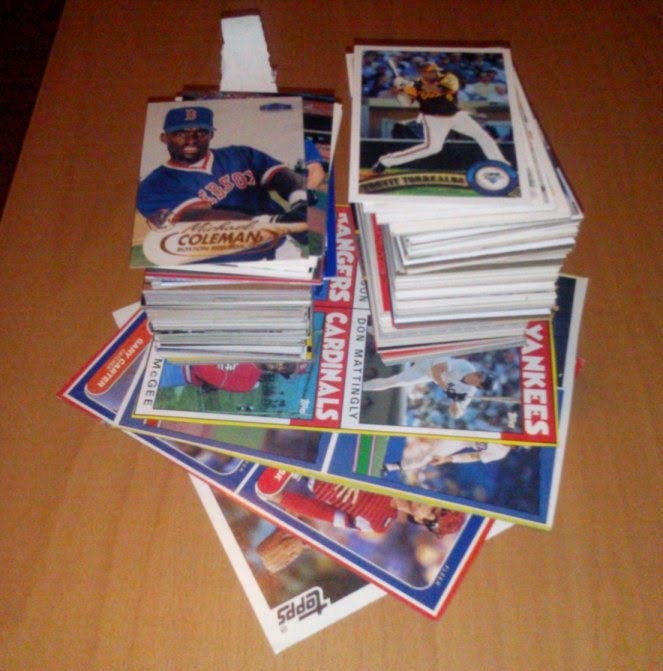 Here's the main crux of the box - 113 cards of players bunting. 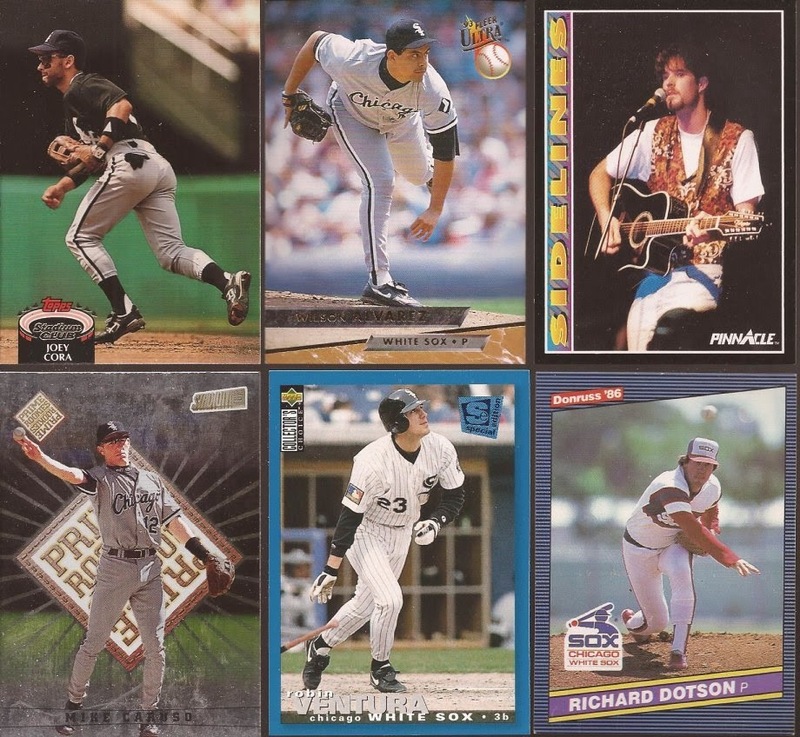 Unfortunately, only 22 we new cards, However, there were plenty of Sox dupes, plus a couple dozen early 90's UD, so I will get those into other collections. 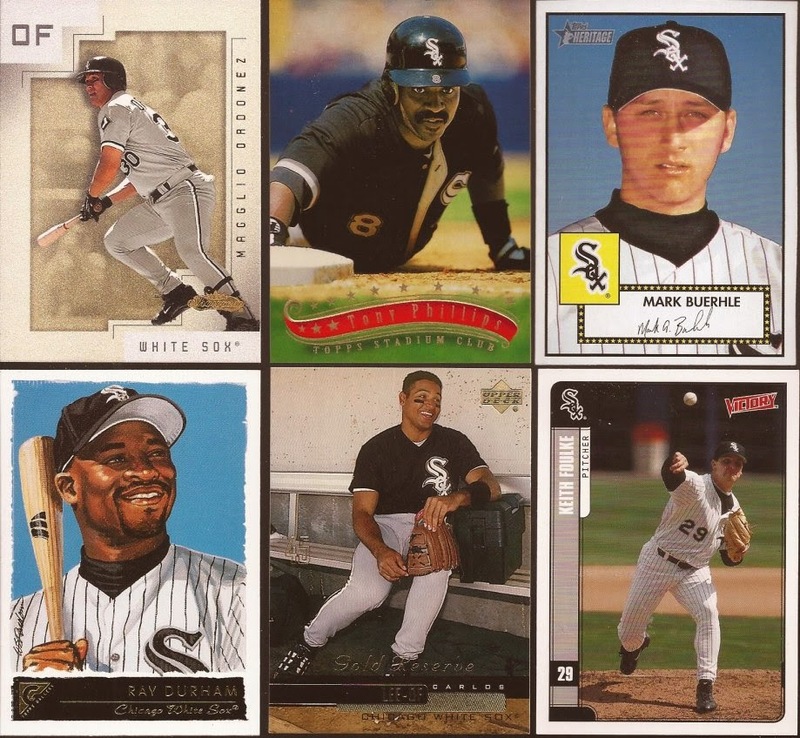 About 150 of the cards were White Sox. And they spanned so many years and sets. Initial sorting and about 40-50% of them I know are not in my Sox box. And those are what I am sure of. Are there some dupes? Sure. But they will make for great TTM requests. On the right is the lone Blackhawks card John sent - a tear out from an SI Kids magazine. On the left - well, you can see. It's a monster Topps of Lamarr. I like how he's only 'stache'd in the action shot, but sporting a beard in the portrait. And lastly were three box bottoms. 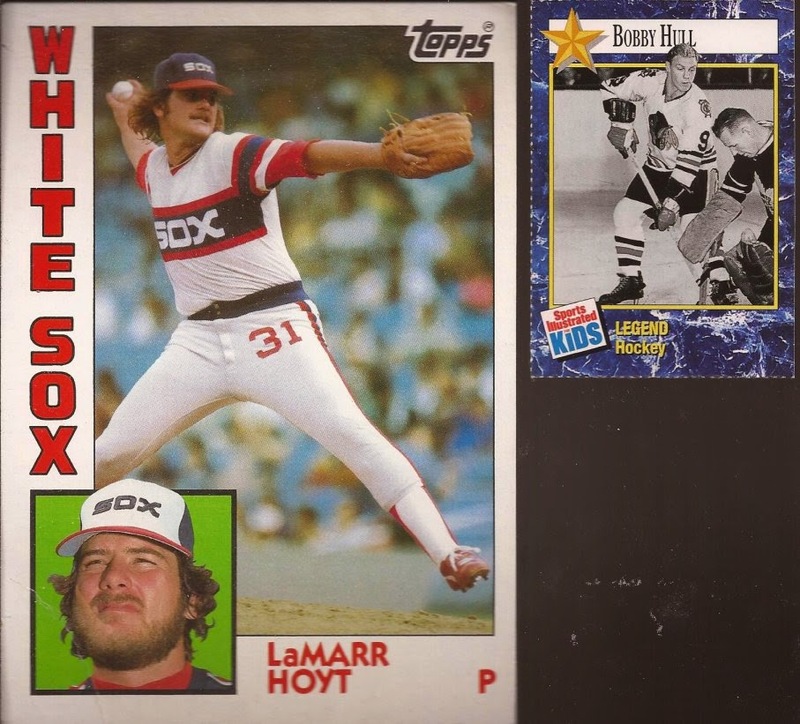 Here is the only Sox on any of the three, but I have zero box cards, whether still grouped or separated by some 8 year old with safety scissors. The Kid's are is so positioned it looks like Carter's card was made my Panini. 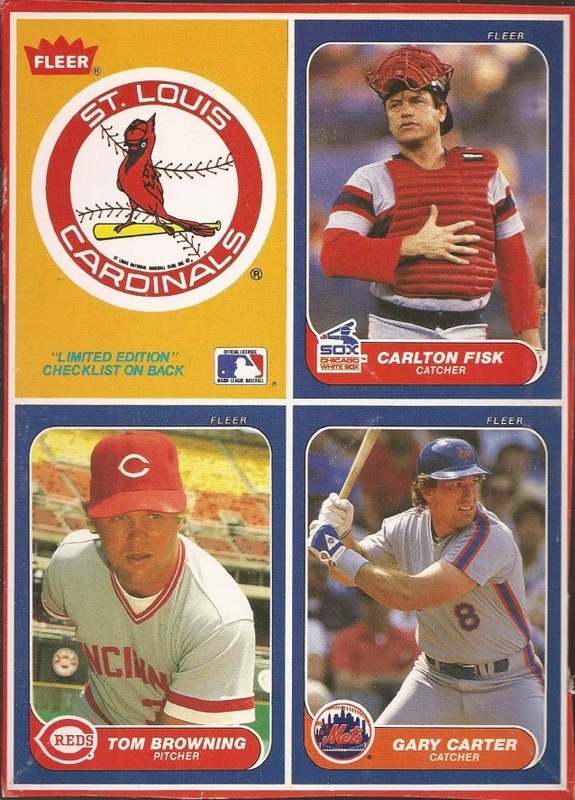 This was a box from '86 Fleer. 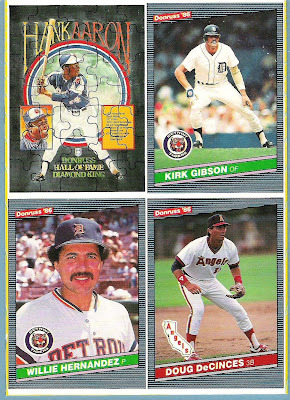 The other box bottoms - one was an '86 Donruss with Kirk Gibson, Williet Hernandez, Doug DeCinces and a Hank Aaron puzzle. 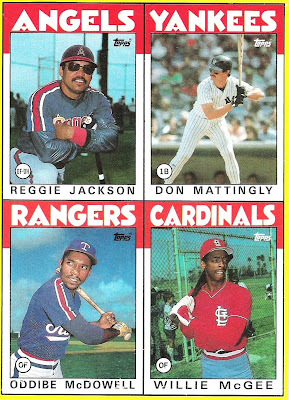 The other is an '86 Topps with Reggie, Donny Baseball, Willie McGee ad Oddibe McDowell. I still have the sorting of all the White Sox cards, but I cannot thank you enough for this box out of the blue. If anyone else feels a need to "Be Like Jay", I can give you my address. I received that exact same box bottom from John a couple weeks ago. I couldn't resist cutting it up.